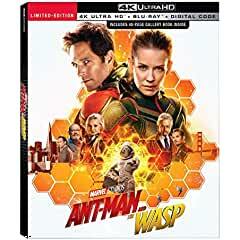 --- Back in the Ant Suit: Scott Lang – Hero and all-star dad Scott Lang keeps the laughs coming for the audience, cast and crew. --- A Suit of Her Own: The Wasp – Highly trained Hope Van Dyne is now the Wasp. See how some of her craziest stunts and action-packed scenes were brought to life. --- Subatomic Super Heroes: Hank & Janet – Hank Pym’s wife Janet was lost in the quantum realm. Trace the legacy of these characters and the iconic actors who portray them. --- Quantum Perspective: The VFX and Production Design of “Ant-Man and The Wasp” – Explore the movie’s visual effects and production design from a whole new viewpoint, in which every micro and macro detail counts. - Gag Reel and Outtakes – Audiences are treated to the hilarious quips that did not make the film as well as exclusive outtakes from Stan Lee and Tim Heidecker. --- Gag Reel - Join in the fun with these outtakes from the set. --- Stan Lee Outtakes - Stan Lee tries out a series of hilarious one-liners for the scene in which his car shrinks. --- Tim Heidecker Outtakes - Check out Whale Boat Captain Daniel Goobler and his improvised whale-watching riffs. --- Worlds Upon Worlds - As Janet leads Hank through the surreal landscape of the quantum realm, they encounter an intelligent life form. --- Sonny’s on the Trail - On the hunt for Hank Pym and his lab, Sonny Burch and his henchmen check the security camera of a neighborhood bookstore. - 10 Years of Marvel Studios: The Art of the Marvel Cinematic Universe – See what it takes to bring the MCU to life, and the role concept artists play in bringing Super Heroes from comic book to screen. - Online Close-Up Magic University – This commercial will inspire you to expand your mind and maximize your full potential!